When we celebrated the kickoff of the Chicago Region Trees Initiative (CRTI) in July of 2014, we had already spent a year gathering partners and ideas on how best to overcome challenges to the trees in this region. 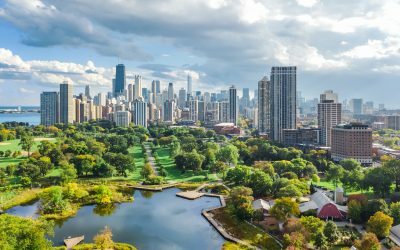 A study done by the US Forest Service and The Morton Arboretum found that all of the trees in the Chicago Region- collectively referred to as our ‘urban forest’- were being threatened by invasive species, limited species diversity, and poor regeneration of our natural oak woodlands. A plan was laid out with dozens of partners, including the formation of work groups, to tackle the key issues- tree stewardship and planting, trees and green infrastructure, forest composition, tree risk assessment and management, and marketing and communications. 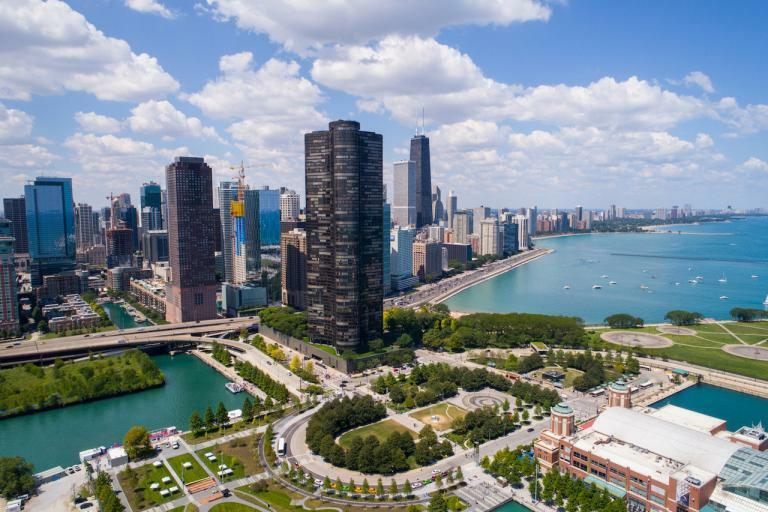 In addition, an Advisory Council of executives from leading green oriented organizations across the Chicago Region were selected as lead partners to steer the Initiative. We’re now coming to the end of our first five years. As we live by our tagline- Science to Action, we’ve become proficient in learning from our experiences and recalibrating our direction. Below are a handful of the lessons we’ve learned. The CRTI has developed valuable resources, planted many trees, and reached new audiences in the past five years, all of which has been made possible through our partnerships. Though The Morton Arboretum has a key role in leading CRTI, most of the goal setting and solution generation comes from the dozens of people who participate in our work groups. Outside of the work groups, our workshops and trainings rely on hosts, speakers, and trainers who volunteer their time to help us. Beyond the ‘active’ partners, we have ‘passive’ partners who have shared their data, either as tree inventories or by filling out surveys about their operational capacity. In a region with 284 municipalities and many more unincorporated areas, we would not have the bandwidth to operate effectively without our partners (you can see a list of our partners here). One of our important lessons in retaining this network has been to make sure our partners are recognized for their efforts. This recognition comes many forms, from our annual Urban Forestry Awards to promoting partner events and resources on our website and in social media, to including partners in any press we receive. We also include partner logos on resources that are created. It is fundamental to our collaboration that those partnerships that support our shared mission should be celebrated and promoted. Our July 2018 Community Tree Network event took us and fifty friends on a bus tour of nurseries in the west suburbs. Furthermore, supporting strong partnerships has helped us in the promotion of our own initiatives. For example, in our state, oak ecosystems are in a state of decline. In an effort to spread awareness about the problem, we were able to get our governor to proclaim October each year as OAKtober– Oak Awareness Month. By sending the word through our network and partners, we were able to get 44 letters of support for our proclamation and saw 77 events hosted across the state in the first year. Truly, our partners are the foundation for our success. As previously mentioned, having so many partners means we are able to gather a lot of data about what is happening in this region. Because public land managers have been so willing to share their inventories, LiDAR data, and survey answers with us, we now have what is likely the biggest urban forest database in the country and a solid understanding of the needs and struggles of our urban foresters. The data we have gathered about trees in this region are powerful, but are mostly meaningful because they are in fine enough in detail to be applicable at a local scale. We spent our first few years gathering data so we could identify solutions based on need and not speculation. But we also learned an important lesson along the way: in order to apply the solutions, we need to be able to tell landmangers about specifics on their land. In the past two years, we’ve generated Canopy Summary Packets for all 284 municipalities and for the 16 community areas in Chicago and have made them publicly accessible on our website. The summaries provide detail about how much canopy cover a community has and how it’s distributed by land use. 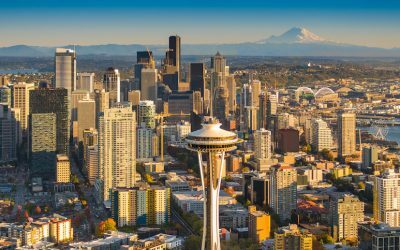 They also report on the value of those trees based on iTree calculations (iTree is free, peer-reviewed software suite from the USDA Forest Service that provides urban and rural forestry analysis and benefits assessment tools). Where available, we offer information on species diversity and make recommendations for diversification. We’ve also been able to use this information to identify communities in need and offer School Tree Planting Grants and technical assistance in those targeted communities. Along a similar vein, we have mapped all of the oak ecosystems in the region, identified core areas, and connecting corridors for prioritized outreach. Once again, having fine scaled data has allowed us to zoom into core areas and identify private landowners to work with. Our Oak Ecosystem Restoration efforts are stronger for being able to speak about the history and interconnectedness of each site specifically. Stakeholders in Kane County discussing canopy and oak conservation goals for their county (2017). Like many urban re-greening collaboratives, one of the major goals of CRTI is to increase the size of our canopy cover. Bigger trees provide more services than smaller trees. 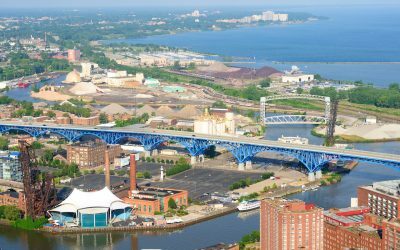 For example, they provide more flood mitigation, air pollution removal, heat island reduction, and energy cost reduction. Similarly, areas with more canopy coverage benefit more from those services than areas with less canopy coverage. It would seem that the obvious answer here is to plant more trees. Unfortunately, a solution utilized in other areas of the country to expand canopy is to plant lots of little trees in the ground and walk away. Without proper care and protect this results in a lot of little dead trees. One of the lessons we were fortunate to learn from our partners (rather than from direct experience) is that our biggest challenge is not in getting millions of trees into the ground, but rather changing a culture to make trees valued and understood. The best way to grow canopy is to promote smart planting practices, teach proper care of trees, and to inspire residents to appreciate and care for the trees they have. To this end, we’ve developed several resources and ongoing programs that bolster tree selection, planting, and care efforts and that reach wide and deep into our region’s communities. For example, each year we run two, two day Urban Forestry Basic Trainings to teach non-arborists basic skills and safety in planting, pruning, plant health care, and chainsaw operation. 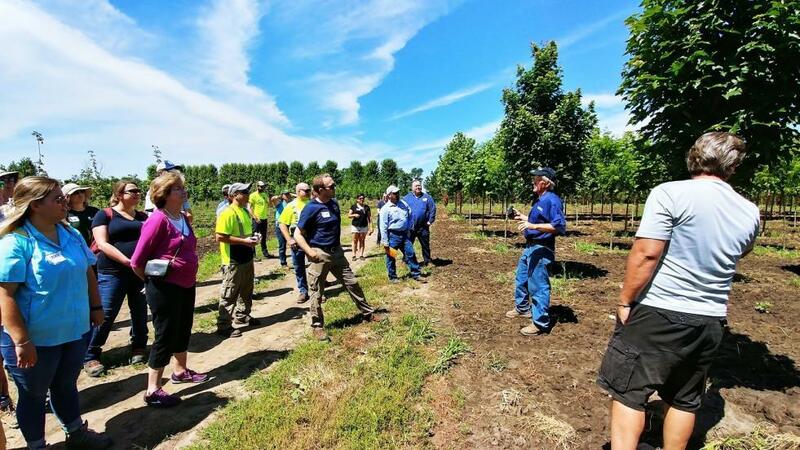 We also organize quarterly Community Tree Network workshops to connect professional and nonprofessional staff who have some type of interaction with trees for peer-to-peer mentoring. We also have a bilingual door hanger that addresses how to properly mulch and water trees so community partners have a trusted reference in hand when reaching out to neighbors about fixing small mistakes- like the volcano of mulch piled two feet high around their tree’s trunk. Many of our direct outreach efforts are also supported by other tools we have developed, such as our online Tree Selector Tool and Tree Ordinance Templates. 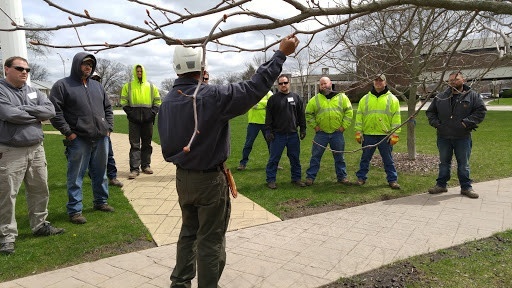 Davey Tree Expert’s Eduardo Medina leading a pruning instruction at the spring 2017 CRTI Urban Forestry Basic Training in Park Forest (Cook County). Communication is two way, and we’ve also spent a lot of time listening. 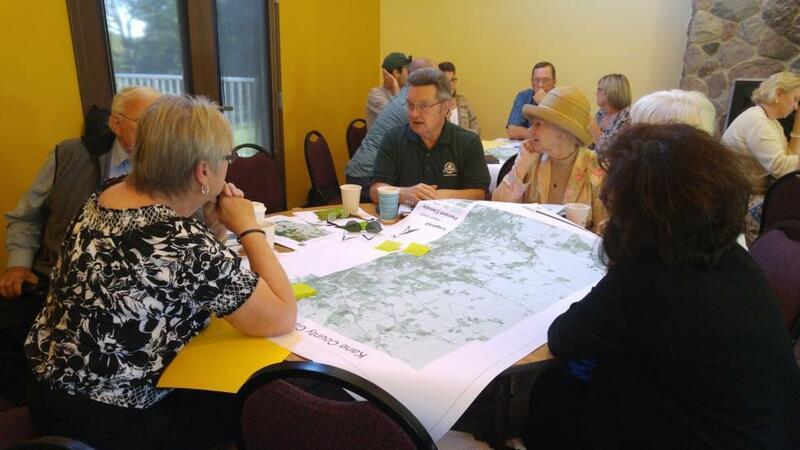 In preparing our Master Plan (due out this winter), we met with stakeholders in each of our seven counties to get direct input on reasonable and aspirational goals for canopy cover and oak ecosystem preservation. The differences among counties was stark and made a strong impact in the final framing of our plan. With a region as broad as ours and with goals as lofty as ours, we expect to continue to learn with every passing year. We are very fortunate to have the support of partners willing to share their knowledge and expertise as well as learn and grow with us.bridging the gap between scientists and forestry practitioners in her role as coordinator of CRTI. Great article! The links you included helped underscore the level of detail and thought that went into planning this project, and making it sustainable. That template could be used in other areas/regions, and of course, what a fabulous resource for the Chicagoland area! Sorry to see that Downers Grove, IL (city in Dupage County) did not provide the information needed to be part of the interactive maps. They have data that should be included in this larger resource. Thank you for sharing a snapshot of what’s happening up in Chicago. Some cities require property owners to make public improvements, such as to repair the sidewalk in front of their property, before they sell the property. Here is the link to an article that explains the benefits of requiring property owners to plant a street tree in front of the property before selling the property. The article explains why trees would be planted in front of most properties within ten years. Please let me know if this idea interests you. I wonder if the heavy Maple removals at Ryerson Woods has been re-evaluated? The scale here failed to identify the old growth Maple-Basswood-cherry stand that was within an otherwise Oak dominated forest. The Des Plaines river has, as an historic fire break has allowed many stands of northern hardwoods to develop from peer settlement times. These stands were used by the native peoples. to make maple products and shelter from prairie fire. Reviews of the results at Dam 1 and the clear cut north of Dundee Rd. Should also be done with a willingness to admit mistakes. It’s my belief that changing forest preserve rules to allow selling high value timber on the commercial timber market was a mistake and should be reconsidered . Over time , the incentive to harvest high value timber to finance operations is too tempting and subject to abuse. Lastly, a heads up. While the 8” and smaller removals st East Woods of Morton Arb isn’t terrible, it will impact the ephemeral wildflowers and general diversity. More important , this procedure has often been the precursor to heavy removals as it gives room for heavy equipment to operate. I’d be glad to give more detail and scope at a meeting or in correspondence. I own and manage 300 acres of high value forest in the Midwest and Western North Carolina. This is an excellent article and we in a community called Roseland in northern California hope we may be able to follow up on this.